Assuming that there is no misalignment condition to cause unnatural wear, the life of tires depends largely upon car operating conditions and driving habits. Tires wear at a much faster rate in some localities than in others because of road and operating conditions. Some types of roads are much more abrasive than others. Tire wear is also dependent upon the number of hills and mountains which the car must go up and down, the severity of grades, the number of starts and stops, driving speeds, the amount of rain and snow, and prevailing temperatures. Tire wear increases rapidly with both speed and temperature. Tires used at low Speeds or in cool climates will have longer life than tires used for high speed driving in hot climates. Driving habits have a very important bearing on tire life. A careful driver may obtain much greater mileage from a set of tires than would be obtained by a severe or careless driver. Rapid acceleration and deceleration, severe application of brakes, taking turns at excessive speed, high speed driving, and striking curbs or other obstructions which lead to misalignment are driving habits which will shorten the life of any tire. Maintenance of proper inflation pressure and periodic interchanging of tires to equalize wear are within the control of the driver. Underinflation raises the internal temperature of a tire greatly, due to the continual friction caused by the flexing of the side walls. Tire squealing on turns is an indication of underinflation or of excessive speed 011 the turns. A combination of underinflation, high road temperatures, and high speed driving will quickly ruin the best tire made. High speed on straight highways causes more rapid wear on the rear than on the front tires, and driving turns and curves at too high a rate of speed causes the front tires to wear much faster than the rear tires. An inspection of the tires, together with information as to locality in which the car has been operated will usually indicate whether abnormal wear is due to the operating conditions described above, or to mechanical faults which should be corrected. The various types of abnormal tire wear and their causes are described in the following subparagraphs. When a tire is underinflated, the side walls and shoulders of the tread carry the load while the center of tread folds in or compresses due to the low internal air pressure. This action causes the shoulders to take all of the driving and braking load, resulting in much faster wear of shoulders than of the center of tread. See figure 7-6, view A. For maximum results in handling, riding and tire life, tire inflation pressures should never be allowed to go below the specified minimum pressure (par. 1-1). Continuous high speed driving on curves, right and left, may produce tread wear very similar to underinflation wear and might very easily be mistaken for such. Side thrust when rounding turns causes wear on the sides of tire tread. In making a turn to the left, especially at high speeds, the outside shoulder of the right tire and the inside shoulder of the left tire take the side thrust and naturally receive the most wear. The only possible correction is to advise slower speeds on curves. Do not increase tire inflation pressures beyond specified limits as this will cause center or overinflation wear (subpar. c, below). On a tire that is overinflated the center of the tread receives much more driving and braking strain than the sides or shoulders. The center of tread therefore wears away much faster than the shoulders and, if tire is continuously overinflated, may be worn thin while the shoulders have plenty of tread material left. See figure 7-6, view B. When tire inflation pressures are maintained within the specified limits (par. 1-1) the tire will make a full contact across the entire width of tread, thereby distributing the wear evenly over the total surface of the entire tread area. When the front wheels have an excessive amount of either toe-in or toe-out, the tires are actually dragged sideways when they travel straight down the road, and cross wear or scraping action takes place, rapidly wearing away the tread of tires. This cross wear condition will usually produce a tapered or feathered edge on the ribs of the tire tread. See figure 7-6, view C. In most cases this can be detected by rubbing the hand across the tire tread. If the tapered or feathered edges are on the inner sides of the ribs on one or both sides, it indicates that one or both tires have excessive toe-in, while the same condition in the outer sides of ribs indicate excessive toe-out. See paragraph 7-17 for toe-in correction. Cases may be encountered where one front tire definitely indicates toe-in wear while the opposite tire indicates toe-out wear. Whenever this condition is indicated always check the steering geometry or turning angles of both front wheels as described in paragraph 7-17. It may be found that the turning angles are not according to specifications, so that the inside wheel on both turns either toes-in or toes-out too much, resulting in cross wear on turns only. Incorrect turning angles are caused by bent steering arms. Cornering wear caused by high speed driving on curves (subpar. f. below) sometimes has the appearance of toe wear. Care must be used to distinguish between these two types of wear so that the proper corrective measures will be used. Excessive wheel camber, either positive or negative, causes the tire to run at such an angle to the road surface that one side of the tread wears much more than the other. See figure 7-6, view D.
The amount or angle of the camber wear will be governed by the amount of positive or negative camber in relation to the perpendicular, and by the shape of the road surface. With any given camber angle, tires driven on modern flat concrete highways will show greater camber wear than when driven on the earlier type crowned highways. Camber wear may or may not be smooth or uniform, depending largely on the tire tread design. Tire tread wear very similar in appearance to camber wear may be caused by driving on turns at excessive speeds. This “cornering” tread wear (subpar. f, below) cannot be corrected by change of camber angle. Adjustment for specified camber is covered in paragraph 7-17. The modern independently sprung automobile allows the driver to negotiate turns at a much higher rate of speed with the same feeling of safety that he had with the older type cars. This fact is responsible for a comparatively new type of tread wear that can easily be mistaken for toe or camber wear. When a car is making a turn, the tires are supposed to be rolling in a circle. When the turn is made at high speed, however, centrifugal force acting on the car causes the tires to be distorted sideways and to slip or skid on the road surface. This produces a diagonal cross type of wear, which in severe cases will result in a fin or sharp edge on each rib of the tire treads. Cornering wear can be distinguished from toe or camber wear by the rounding of the outside shoulder of the tire, and by the roughening of tread surface in this section denoting severe abrasion. See figure 7-6, view E.
No alignment or tire pressure change can be made that will relieve cornering wear. Only the driver can effect a cure, and that by slowing down on the curves. Heel and toe wear is a saw-tooth effect with one end of each tread block worn more than the other. The end which wears is that which first grips the road when the brakes are applied. High speed driving and excessive use of the brakes will cause this type of irregular tire wear. This type of wear will occur on any type of block tread design. 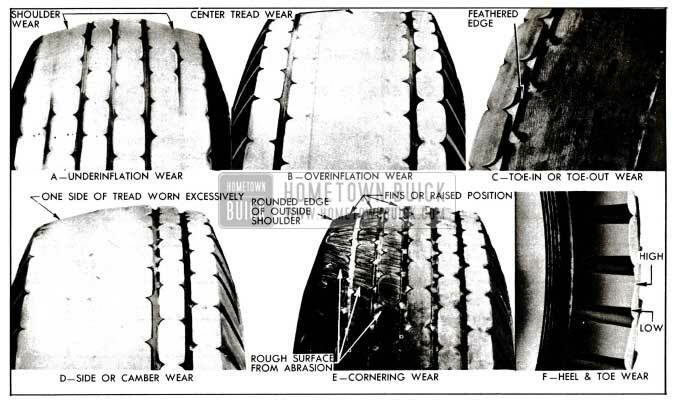 See figure 7-6, view F.
Heel and toe wear is not so prevalent on the rear tires because of the propelling action which creates a counteracting force which wears the opposite end of the tread block. These two stresses on the rear tires wear the tread blocks in opposite directions and result in more even wear, while on the front tires the braking stress is the only one which is effective. This may be counteracted by interchanging tires (par. 7-8). A small amount of irregular wear, slightly saw-toothed in appearance, at the outer segments of tires is a normal condition and is due to the difference in circumference between the center and the outer edges of the tire tread. This saw-toothed appearance, however, will be exaggerated by underinflation, improper toe-in, or both. Many combinations of factors may cause the types of tread wear listed here; therefore it is never possible to say definitely that any one condition is the cause. As stated above (subpar. g) a small amount of irregular wear at the outer segments of tires is a normal condition; however, irregular wear extending toward center of tread is due to wheel misalignment conditions which should be corrected. Careful checking and adjustment of all wheel alignment factors (par. 7-17) will reduce such wear. An overinflated tire tends to bounce instead of keeping in contact with the road surface. On turns this bouncing produces scuffing and may cause flat spots to develop. A tire that is statically unbalanced bounces or hops on the road, causing rapid and uneven tread wear. Uneven brake adjustment or grabbing brakes will cause rapid and uneven tread wear. Out of round brake drums will cause flat spots to develop on tire treads. Wabble or runout of a tire, either front or rear, due to bent wheel or to tire being improperly mounted will cause uneven wear. The runout of wheel and tire when rotated should not exceed 1/8” at side of tire. throughout the steering system all tend to allow the front wheels to kick around, and if any of the wheel alignment factors are incorrect, irregular spotty tire tread wear of one type or another may result. Regardless of the original cause of spotty tread wear on either front tire, no alignment or balance job, however perfect, can prevent future excessive wear of the spots. Once a front tire acquires flat or cupped spots extra rapid wear will continue, caused by the braking and steering strains on the thinner and weaker sections of the tread. A thorough mechanical and alignment inspection, plus a check for wheel and tire unbalance, should uncover the cause or causes of the irregular wear. At the time of correction, however, the cupped tire should be interchanged with a rear tire on which the tread runs true. The cupped tire will, to a certain degree, true itself up on a rear wheel because being rigidly mounted to the axle shaft it can only revolve, absorbing first the driving and then the braking strain. Measurement of the 1955 Buick trim dimension with 1955 Buick springs installed is the only practical method of checking chassis springs that are reported to be weak. See paragraph 7-13 for checking trim dimension. The strength of chassis springs cannot be determined by measurement of the free length when removed from car, because springs of equal strength under rated load may vary considerably in length when not loaded. 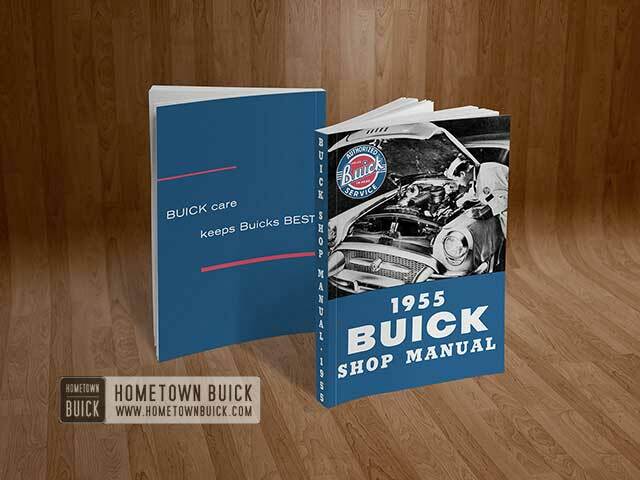 Many 1955 Buick shock absorbers have been replaced and returned to the factory with the report that they were weak. When tested with special factory equipment very few of these replaced units have been found weak or otherwise below standard in operation. This indicates that these shock absorbers were needlessly replaced in an attempt to improve riding conditions that were actually standard, or that erroneous methods were used in judging the operating condition of the units. Before attempting to test shock absorbers make sure that all attaching bolts are tight and that the rear units are filled with specified fluid (par. 7-15). Tires should be uniformly inflated to specified pressure (par. 1-1). The chassis should be well lubricated to make sure that suspension parts are free moving. Test each front and rear shock absorber in turn by quickly pushing down and then lifting up on the end of the car bumper adjacent to the unit being checked. Use the same force as near as possible on each test, and note the amount of resistance provided by the shock absorber on compression and rebound. A little practice on another car of the same model which has satisfactory ride control will aid in judging the amount of resistance that should exist. Both 1955 Buick front shock absorbers should provide the same feeling of resistance and both rear shock absorbers should do likewise. Any noticeable variation between right and left shock absorbers indicates that one unit is not operating normally. Little or no resistance on compression or rebound indicates air in shock absorbers, internal leakage due to wear, or that the valve is held open by dirt. Excessive resistance indicates that bleeder hole in valve is plugged with dirt. If there is any doubt about the action of a 1955 Buick front shock absorber after testing as described above, remove the unit from car. Mount it vertically in vise with safe jaws gripping the mounting eye firmly, then move the outer tube up and down by hand. There should be no free movement in this test. A faulty shock absorber must be replaced as it cannot be disassembled for repairs. If there is any doubt about the action of a 1955 Buick rear shock absorber after testing as described above, disconnect shock absorber arm at the outer end. Quickly move the arm up and down through complete range. There should be no free movement in the arm, and the force required to move arm up and down should be almost equal but with slightly greater resistance on the upward movement. Lack of resistance to movement of the arm indicates air in shock absorber, internal leakage due to wear, or that the valve is held open by dirt. Excessive resistance indicates that bleeder hole in valve is plugged with dirt. Air may be worked out of a rear shock absorber by removing filler cap and moving the arm up and down through full range and adding fluid as described in paragraph 7-15. If a valve is plugged or held open by dirt, or internal leakage due to wear exists, the shock absorber must be removed for replacement of valve or shock absorber assembly. In either of the tests given above, the amount of force that can be applied is not sufficient to open a valve against its spring pressure; therefore these tests only check the flow of fluid through the valve bleeder hole as well as any leakage due to a valve being held open or due to internal wear of piston and cylinder. Since it is unlikely that the valve springs will weaken in service, it may be assumed that the 1955 Buick shock absorber action is normal if it operates satisfactorily in the tests given above. Steering action is dependent upon the 1955 Buick chassis suspension members as well as the steering gear assembly and tie rods. Improper steering actions which are most likely to be caused by 1955 Buick chassis suspension are covered in this paragraph, while conditions most likely to be caused by the steering gear assembly or tie rods are covered in paragraph 8-3. Low or uneven tire pressure (par. 1-1). Front tires of unequal diameter due to wear. Brakes dragging on one side (par. 9-8). (5) Shock absorbers low in fluid or inoperative (par. 7-5). Incorrect caster, camber, or toe of front wheels (par. 7-17). Brakes incorrectly or unevenly adjusted. Dirt or grease on lining (par. 9-8). Incorrect or uneven caster or bent steering knuckle (par. 7-17). Wheels toe out in straight ahead position (par. 7-17). Incorrect or uneven caster or camber (par. 7-17). Steering gear or tie rods adjusted too loose or worn, or adjusted too tight (par. 8-4). Steering knuckle bushings or king pins worn (par.7-17). Loose torque ball (par. 4-12). Low or high tire pressure (par.1-1). Wrong type or size of tires used (par. 7-1). Steering gear or tie rods incorrectly adjusted. Broken tie rod spring (par 8-4). Shock absorbers inoperative or leaking (par. 7-5). Wrong valving (par. 7-1). Improper caster or bent steering knuckle (par. 7-17). Steering knuckle bushings or king pins worn (par. 7-11). Low Speed shimmy is a rapid series of oscillations of the front wheel and tire assembly as the wheels attempt to point alternately to the right and left. This movement is often transmitted through the steering linkage to the steering gear. Low Speed shimmy usually occurs below 30 MPH. Uneven or low tire pressure (par. 1-1). One or both wheel and tire assemblies out of balance (par. 7-16). Front wheel bearings loose or worn (par. 7-10). Steering gear or tie rods incorrectly adjusted or worn (par. 8-4). Wheel tramp, sometimes called high speed shimmy, is a rapid up and down movement of a wheel and tire assembly, as though the tire was decidedly eccentric. In severe cases the tire actually hops clear of the road surface. Wheel tramp may develop in either front or rear wheels, and occurs at speeds above 35 MPH. Wheel, tire or brake drum out of balance (par. 7-16). Shock absorber inoperative (par 7-5). Item 1 or 2 in combination with one or more items listed under Front Wheel Shimmy (subpar. e, above). 1955 Buick roughness or vibration may be caused by road surface conditions as some types of road set up unusual vibrations in cars at various speeds. Testing the 1955 Buick on a different type of road will show whether the road is causing the vibration. Some types of tire treads, as well as tires having more than four plies of fabric may cause abnormal vibration or roughness. If car is equipped with tires other than those which have been selected for production equipment (par. 7-1) it is advisable to test the car with standard tire equipment before deciding that a mechanical condition is the cause of roughness. The following procedure should be used to determine cause of 1955 Buick roughness or vibration in car operation at various speeds, which may be due to an unbalanced condition of wheels, tires, brake drums, propeller shaft, or engine. Jack up all wheels, having jack support rear end of car at center of rear axle housing. Check runout of front and rear wheels and tires. Runout should not exceed %” at side of tire. With transmission in third speed or “direct” run engine at various car speeds to note speeds at which vibration or roughness occurs. Remove rear wheels and run engine again at the critical speeds noted in step 3. If roughness is gone the condition is caused by unbalanced wheel and tire assemblies (par. 7-17). If roughness still exists with rear wheels removed, remove rear brake drums and repeat the running test. Elimination of the roughness indicates out of balance brake drums (par. 9-12). If roughness still exists with brake drums removed, run engine with transmission in neutral. Elimination of the roughness indicates that propeller shaft is out of balance. Continued roughness with engine running alone indicates an out of balance condition of engine.